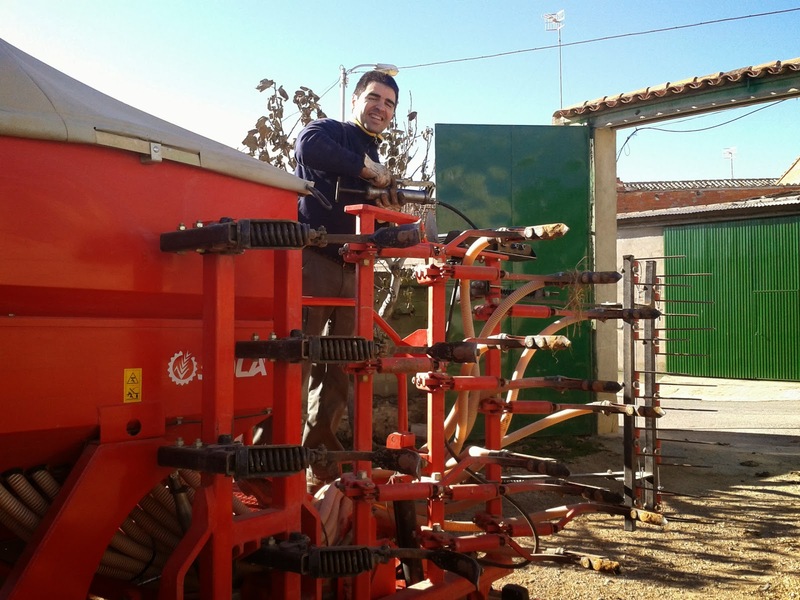 The period to the vineyard restructuring is opened and lots of farmers have decided to update their vineyard or to change their varieties. We don't own vineyards, therefore, this issue is not really well-known for us. 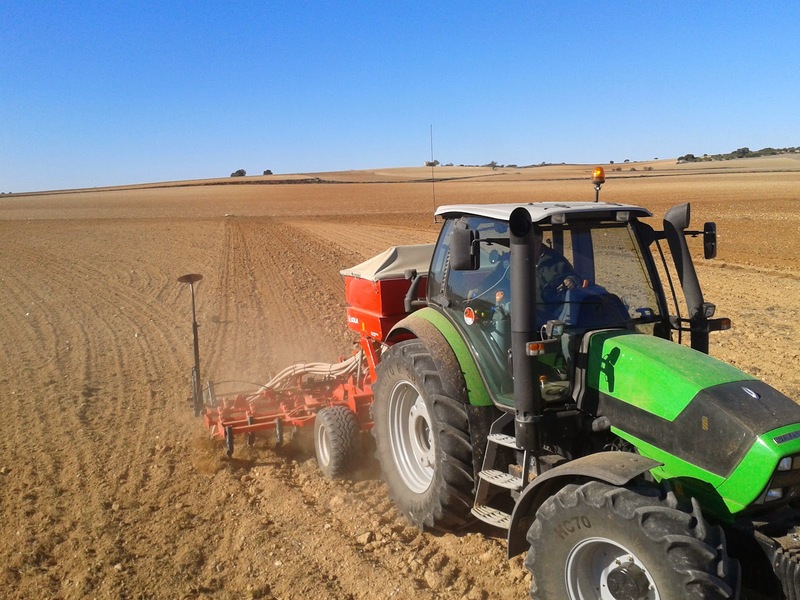 This time, there are 210 millions of euros for these aids (2014-2018), which could achieve 6,000€/ha... if you are interested in this issue you can visit masquemaquina.com blog, where you can find much more related information. One of the financed tasks is the vine removal when the objective is renewing them with a trellis arbor system. We were pleased to spend one morning with Avelino Bonilla who was working with his New Holland TM190 taking out vines.The tool he used to remove them was a enormous plough and the truth is that it worked absolutely well, since the tractor doesn't require to do an excessive effort and the result was excellent (Avelino told us that previously he used another tool which needed the P.T.O. and the tractor worked much more than nowadays). 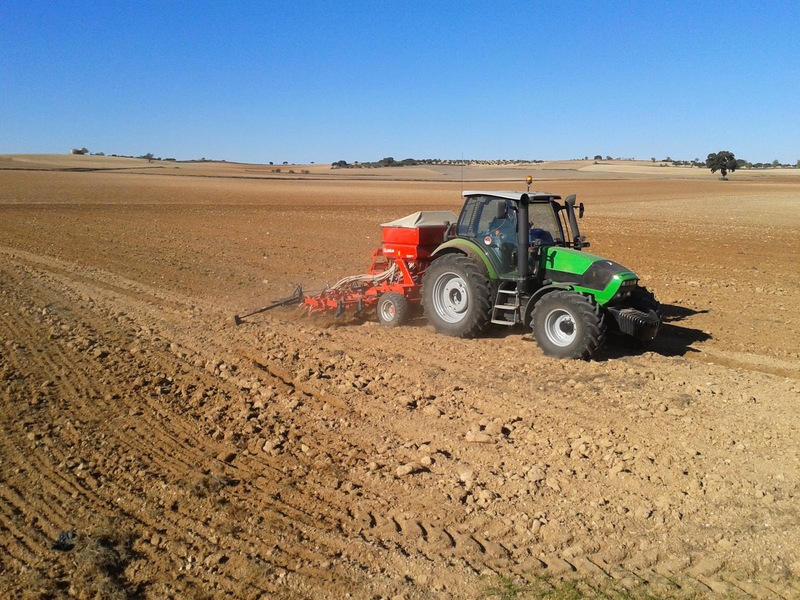 We would like to begin this post with the words which summarize the feelings of all farmers in our area (and largely of Spain) this year; these feelings are concern, sadness, apathy and ruin. This year is being absolutely dry (it has not rained since May in our area), and the soil is not ready to sow. 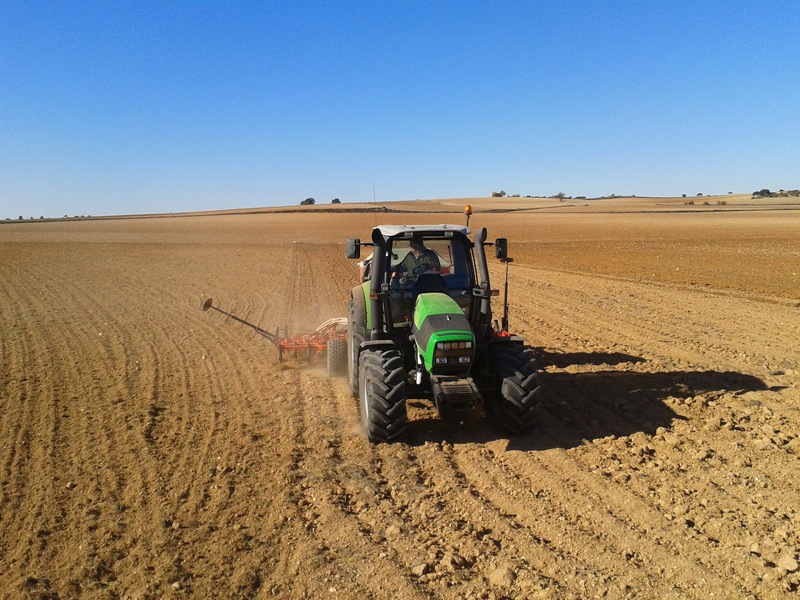 In some fields, barley has sprouted (what was sowed on the first days of November,) but it is drying and some farmers are going to have to sow them again... we hope God helps us!. 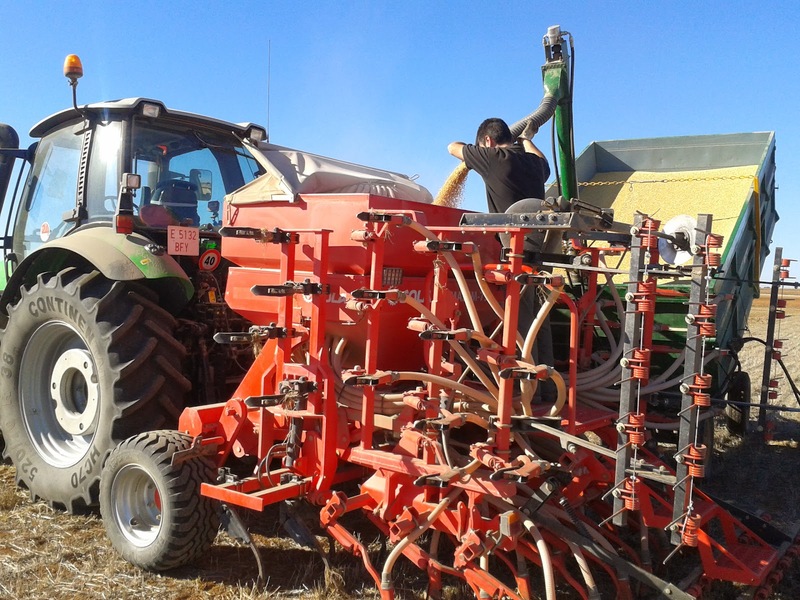 Regarding our seed drill, whose previous owner was our friend Alberto (he sold it to us because he wants to practice minimun tillage) so it is second hand (he bough a Horsch... we spoke about that in this post). 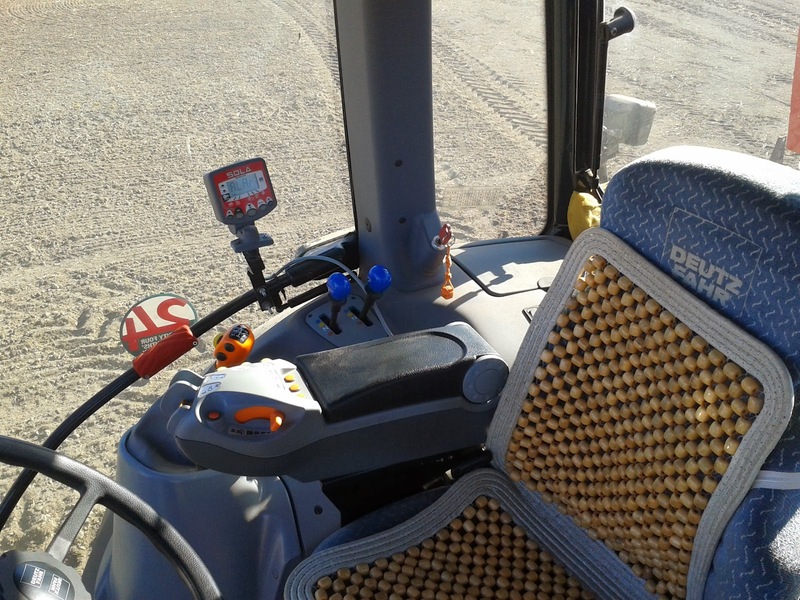 The machinery was manufactured in 2007 and it is in perfect conditions. We have a small problem with the computer but thanks to Jordi Llorens (who is an employee of Solá Group), we are fixing it. 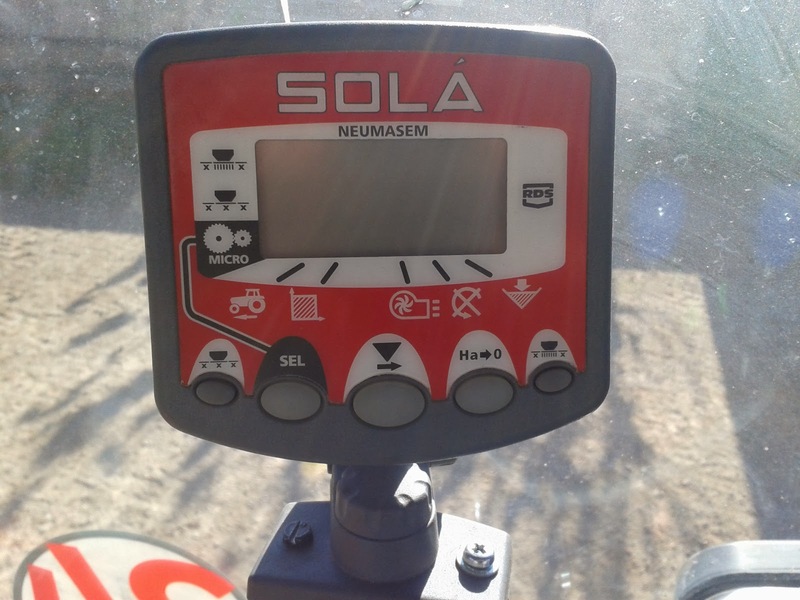 The seed drill is a Solá Neumasem 799. 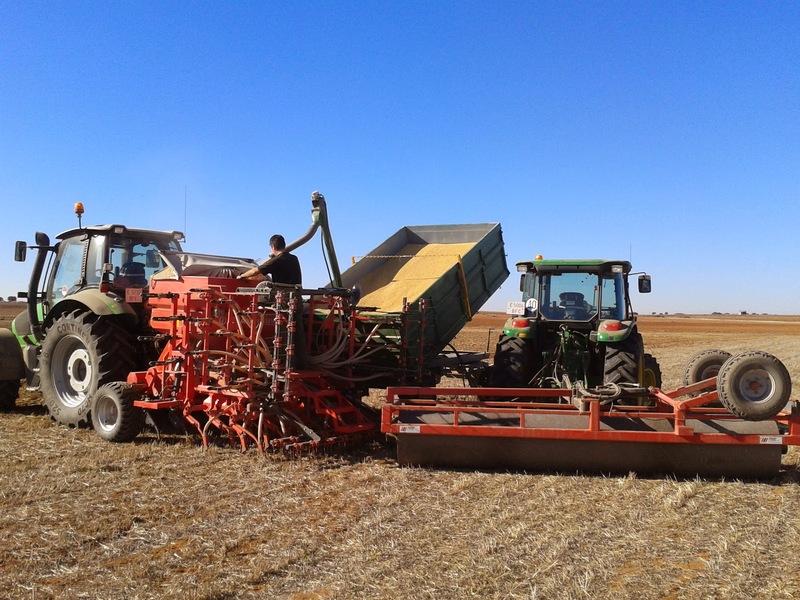 Working width of 5m (40 rows and row spacing of 12.5cm). It is equipped with coulters. 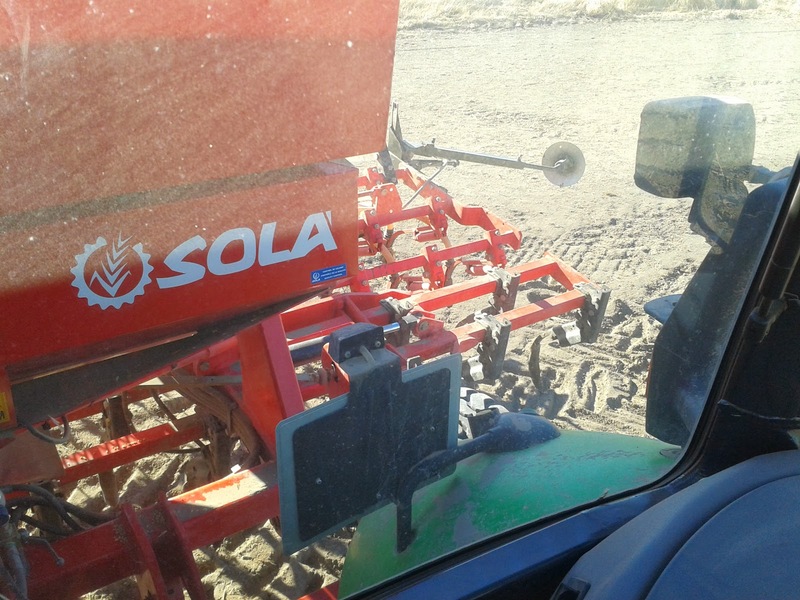 Soil tillage implements of 16 tines. Calibration kit for the dosing test. 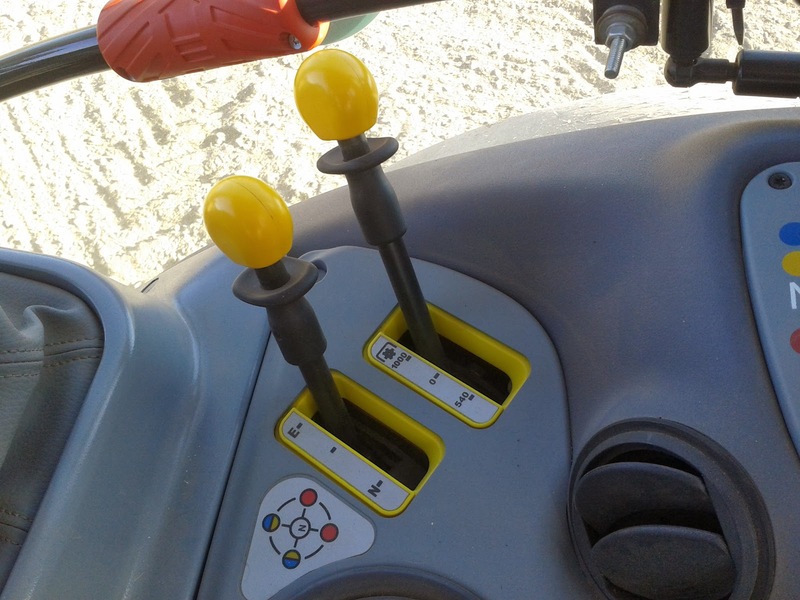 Seed drill control unit for filling using a worm screw. Control system: hectare counter, fan rev. counter, distributor alarm and seed level sensor. Mechanical fan with P.T.O. shaft 1,000 r.p.m. Rear lights to work and transport. Our tractor works very fine with it (although it has only enough power to work on hills). As the P.T.O. 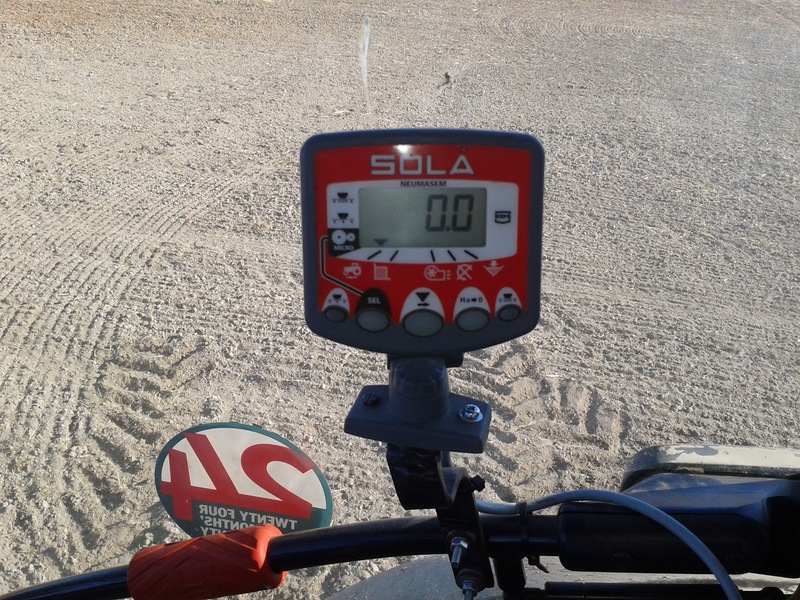 speed of our Agrotron can be configured at 1,000E, the engine works at 1,600 r.p.m. and working speed is of 7km/h (using 3L gear) so the consumption is optimum. 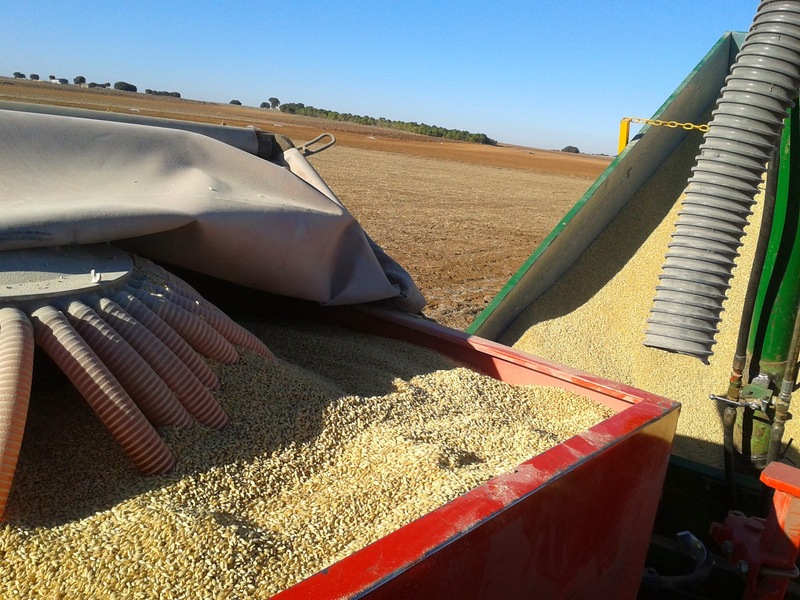 We had to put 4 front counterweights more in order to avoid problems when the hopper of our seed drill is full (total weight is about 3,000kg). 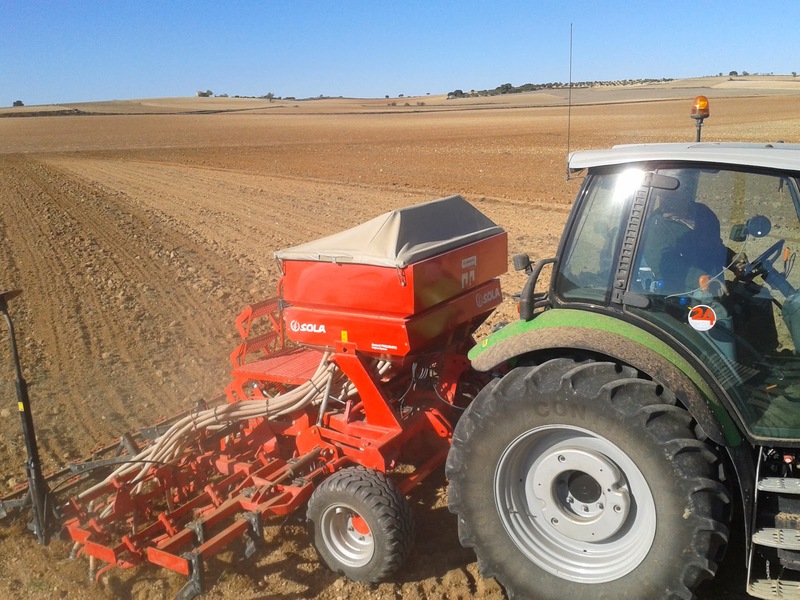 As you can see in some of our pictures, we are using a flat roller after sowing to compact the soil... we hope with this way grain can have a better sprout (we are sowing more grain that other campaigns, 240kg/ha, because we think a lot of grains will be losted before and after sprouting because of the weather).